To fish a weedless bait, any weedless bait, you can either fish with the rod tip up in the air or to one side, 90 degrees on. When the fish strikes either lower the rod tip or if you are fishing to one side point it at the bait and allow the small amount of slack line to be taken by the fish. This will be no more than the length of the rod, therefore usually around 6 to 7 feet. This will indicate that the fish has taken the bait and turned, enclosing its mouth to hide its prey from other fish. It has also depressed the hook guard / hollow body. It is at this point and this point only, that you should strike firmly. The ideal rod would be 6 to 7 1/2 feet, fairly stiff and we would recommend using braid NOT mono, which keeps you in touch with the bait at all times. DON’T FORGET TO USE A SOFT WIRE TRACE. 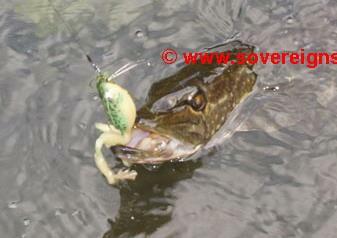 Many of you have contacted us complaining that you are unable to hook fish on weedless baits. There are only two reasons for this, 1) your rod is too soft or 2) you are striking too quickly. Under normal lure fishing conditions (excluding jerkbaiting), you will be fishing rod tip down, rod pointing at the lure.